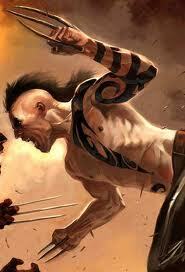 Daken is Wolverine's son and is half Japanese/half Caucasian. Known as Dark Wolverine, he was introduced as a villain but is now in the position of finding his way after a lifetime of being a pawn in other people's designs. He's brilliant, manipulative and constantly switching between the side of angels and the side of self-interest. And he's bisexual. 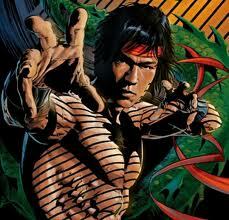 Start reading about him in Dark Wolverine - The Prince. Bishop is African-American and from an alternate and future timeline. He was born into a mutant relocation camp and branded with an M over his eye, standing for mutant. He travelled back to our reality and joined the X-Men, people he knew as legendary figures. You might also know him from the X-Men animated series. He has appeared in several X-Men series, such as Uncanny X-Men, X-Factor, X-Treme X-Men, Ultimate X-Men and District X, of which you buy the first volume here. Julio Rictor is Hispanic and gay. He can generate seismic energy but then lost his powers and is now living as human. 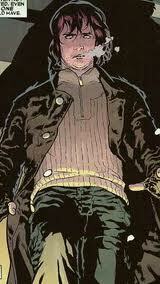 his subsequent depression has been an ongoing storyline in X-Factor since Peter David relaunched it. Try picking up the first volume here. 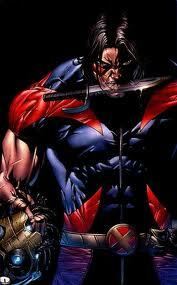 James Proudstar is native American with super speed and strength powers. 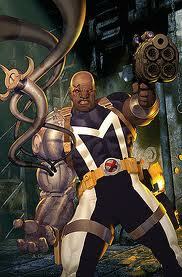 He has most recently been showcased in Craig Kyle and Christopher Yost's X-Force. We recommend starting with the the Necrosha arc which focused on his relationship with his late brother (also a former X-Man). Shang-Chi is Chinese and is a Basic kung-fu hero type who is fighting a life long war against his evil sorcerer father. This battle was most recently explored in what will be the second trade of Secret Avengers. Armor is Japanese. She is a new creation of Joss Whedon and was introduced in Astonishing X-Men - Ghost Box She is a typical X-Men everyman character, the new student introduced to ask question, like the companions of Dr Who, if you are familiar with that franchise. Now we'll look at a few teams. First up, there's The New Mutants. This team has several characters of colour as charter members: Dani Moonstar (native American), Roberto daCosta (Brazilian) and Xi'An or Karma (Vietnamese), Coy Manh (Vietnamese, also one of Marvel's earliest lesbian characters). The 1980s originals by Chris Claremont are surprisingly well-written and available in an ongoing series of TPBs entitled New Mutants Classic and the modern version of the series with the cast as veterans begins with a collection entitled The Return Of Legion. 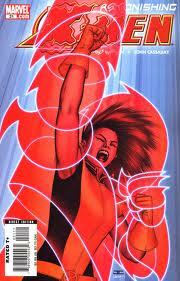 Then there's the New X-Men: Academy X that featured several Characters of Colour. There were the New Mutants Moonstar and Karma as teachers the students included an electrical manipulator called Surge (Japanese), a telepath called Prodigy (African-American) and Sorraya Quadir (Dust, of nebulous Middle Eastern, possibly Afghan origin), pictured right. Sooraya is a controversial character. The original Academy X writers meant to use her insistence on wearing the burkha as a way to explore her religion, her upbringing in the Middle East and interactions with others. They intended for one of the white characters, Jay Guthrie, to convert to Islam to be closer to her after he fell in love with her. Sadly they were taken off the series and Sooraya was never explored in any great depth. We're getting the feeling there's a lot more men than women here aren't we? Don't worry, there are a couple more posts with women in coming up, as well as some more devoted to the men.